Lip augmentation is a simple and safe way to achieve fuller, more sensual, and more youthful looking lips. At Plastic Surgery & Dermatology of NYC, we offer both temporary lip enhancement with dermal fillers such as Restylane® and Juvéderm®, or long-lasting improvement with silicone microdroplet treatments. Depending on your specific goals, lip enhancement may be performed on upper lips and lower lips, either together or individually. Whether you’re looking to enhance your natural lip shape and size, or seeking to improve the appearance of aging and thinning lips, we can help. 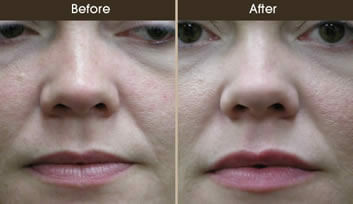 How do dermal fillers work to augment lips? Dermal fillers, such as Restylane® and Juvéderm®, are made from hyaluronic acid, a natural sugar found within the body that helps to provide youthful volume. Well-placed injections of these hyaluronic acid fillers can help plump and shape the lips. 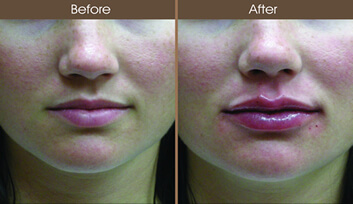 We will customize treatment for your specific needs, depending on the size, shape, and fullness of your lips. In some cases, just the lip border may be shaped for a very natural effect. When extra volume is needed, we can also strategically add filler to the body of the lips. How can I find out more about lip augmentation treatment? Dr. Levine will be happy to meet with you to discuss lip augmentation treatment using dermal fillers. Please call our office at 212-988-1800, or make an appointment online for a personal consultation in our New York City offices. How does silicone microdroplet treatment work? Microdroplets of pure, medical-grade liquid silicone are injected strategically across the treatment area. This will encourage the body to produce new, natural collagen around the silicone droplets, leading to fuller, more defined lip structure. The surgeon’s skill and injection technique are key to producing beautiful, natural-looking results. The number of treatments needed will depend on the amount of augmentation desired. Usually, a series of treatments spaced at monthly intervals will provide the best results. By allowing adequate time for collagen production between treatments, injection placement can be adjusted to provide the most natural-looking results. Dr. Levine will discuss with you what treatment schedule will best suit your specific needs. Silicone microdroplet treatment is performed on an outpatient basis in our offices. The procedure is simple and can usually be completed within 20 minutes. * Topical anesthetic may be used to increase patient comfort. You can resume your normal activities immediately following treatment. How can I find out more about silicone microdroplet treatment? Dr. Levine will be happy to meet with you to discuss silicone microdroplet treatment. Please call our office at 212-988-1800, or make an appointment online for a personal consultation in our New York City offices.